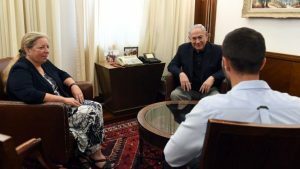 Jordanian Foreign minister Wednesday deplored the warm welcome Israeli Prime Minister Benjamin Netanyahu reserved to the Israeli security guard who killed two Jordanians in the Israeli embassy in Amman Sunday night. Safadi was commenting on PM Benjamin Netanyahu’s hug for the Israeli security guard, identified as Ziv, on his return from Amman following his killing of two Jordanians; 17-year old Mohammed Jawawdeh and Bashar Hamarneh, a physician and owner of the residence. The two victims reportedly entered the mission for carpentry work. Israeli reports say Ziv opened fire on Jawawdeh who stabbed him with a screwdriver. Jordanian reports countered the Israeli accounts saying that Ziv killed the two Jordanians following an altercation over the late delivery of furniture. Netanyahu’s office released photos of Ziv receiving a warm hug from the Israeli leader during their meeting Tuesday. “This is really absurd,” Safadi said. Ziv flew to Israel Monday despite Amman’s reluctance to let him go as security authorities wanted to question him over the incident. Israel protested the move arguing that its security officer was protected by diplomatic immunity. Safadi in an interview with CNN denied claims that Amman stroke a deal with Tel Aviv over the shooting but insisted that it “upheld its international obligations”. Monday Thousands of Jordanians mourned the victims displaying Jordanian and Palestinian flags. Israeli reports say Tel Aviv is set to pay compensation to Hamarneh’s family after it completes the mourning period. Written by: Peter Mulvany on July 27, 2017. Posted by Peter Mulvany on Jul 27 2017. Filed under Headlines, World News. You can follow any responses to this entry through the RSS 2.0. Both comments and pings are currently closed.